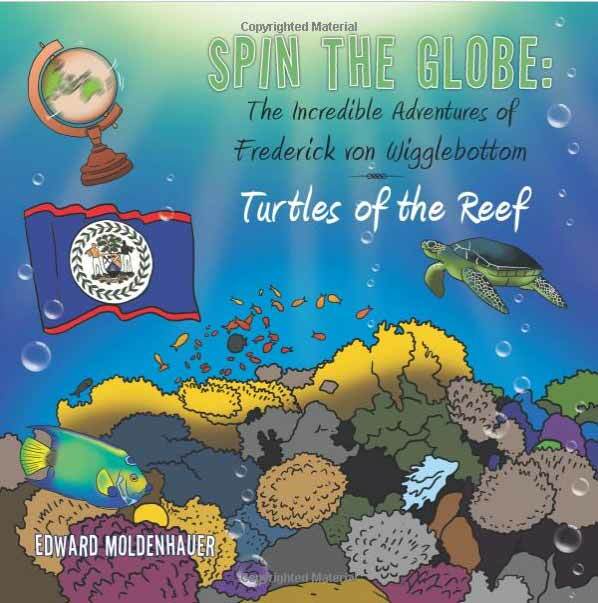 In the new installment of Edward Moldenhauer's Spin the Globe children's series, "Spin the Globe: The Incredible Adventures of Frederick von Wigglebottom: Turtles of the Reef" (published by Trafford Publishing), Frederick von Wigglebottom travels, by the spin of the globe, to Belize. In Belize, Frederick explores the sandy island paradise of St. George's Caye. He meets a native Mayan named K'ayab, who introduces Frederick to his culture and its history and teaches him about the animals of the coral reef and the Belizean jungle. Frederick also befriends a girl named Hayá, who teaches him about her unique Garinagu culture. A magical exploration of the mystical jungle and island paradise of Belize, "Spin the Globe: The Incredible Adventures of Frederick von Wigglebottom: Turtles of the Reef" serves not only to entertain young readers, but also to become a jumping-off point for learning and celebrating the world's unique diversity. "I endeavored to create a distilled version of a country review by using a variety of subtopics which will hopefully plant the seeds for the child to want to learn more," Moldenhauer says of his book. "I want them to take it the next step, seek additional information from any source or even take a trip and experience these wonderful areas in person."